In Part 3 of this video series, we have seen how to create tables (tblPerson and tblGender) and enforce primary and foreign key constraints. In Part 4, we have learnt adding a default constraint. Please watch Parts 3 and 4, before continuing with this session. Cascading referential integrity constraint allows to define the actions Microsoft SQL Server should take when a user attempts to delete or update a key to which an existing foreign keys points. For example, consider the 2 tables shown below. 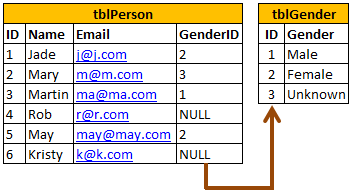 If you delete row with ID = 1 from tblGender table, then row with ID = 3 from tblPerson table becomes an orphan record. You will not be able to tell the Gender for this row. So, Cascading referential integrity constraint can be used to define actions Microsoft SQL Server should take when this happens. By default, we get an error and the DELETE or UPDATE statement is rolled back. 1. No Action: This is the default behaviour. No Action specifies that if an attempt is made to delete or update a row with a key referenced by foreign keys in existing rows in other tables, an error is raised and the DELETE or UPDATE is rolled back. 2. Cascade: Specifies that if an attempt is made to delete or update a row with a key referenced by foreign keys in existing rows in other tables, all rows containing those foreign keys are also deleted or updated. 3. Set NULL: Specifies that if an attempt is made to delete or update a row with a key referenced by foreign keys in existing rows in other tables, all rows containing those foreign keys are set to NULL. 4. Set Default: Specifies that if an attempt is made to delete or update a row with a key referenced by foreign keys in existing rows in other tables, all rows containing those foreign keys are set to default values. 1.what will happen if i have set the action to Default. but i don't have any default constraint set for a particular column. 2. Will the types 2,3 and 4 work for truncate query. Cannot truncate table 'gender' because it is being referenced by a FOREIGN KEY constraint. Hi Hameed, thank you very much for answering Rohan's question. Really appreciate your time. Very few people like you take time to help others. May god bless you. can you please explain the term truncate query???? TRUNCATE removes all rows from a table. The operation cannot be rolled back. Now execute the below statement..
Now execute the Truncate query..
Hi Venkat, Can we do this cascading through writing query ? Yes, You can write a query for cascading, but you can not alter the constraint,so if your table already have a foreign key and you want to set cascade, then you have to first drop that constraint and then add foreign key with cascade, below is the code. Venkat Sir, Please correct me if i am wrong. if i create two foreign keys on the same column.what occurs if collision happens ?? No. You cannot have more than one foreign keys on same column. Even if it was possible how is it supposed to know which table to point for the key value. Having issues in Set Default. >Please let me know if default value can be added to primary key. > I am unable to set Default value in the child table when the data in primary table is deleted. Primary Key having default value doesn't make sense. What if you you don't provide value to PK for two records, Default constraint will kick in and try to give them default and two PK records will have same value contradicting PK constraint itself. So PK cant have default constraint. In order for the cascade default action to take, the FK column should have Default constraint. I have small doubt,can you possible cascading rule using in table on delete one row in parent table,i want to default value in child table.